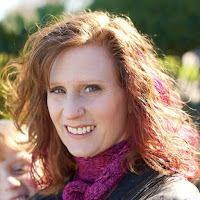 Last week I was thrilled to be approved as a "quilting blogger" on the Quilting Gallery website. Their site keeps a directory of over 5000 blogs from around the world that are specifically about quilting. 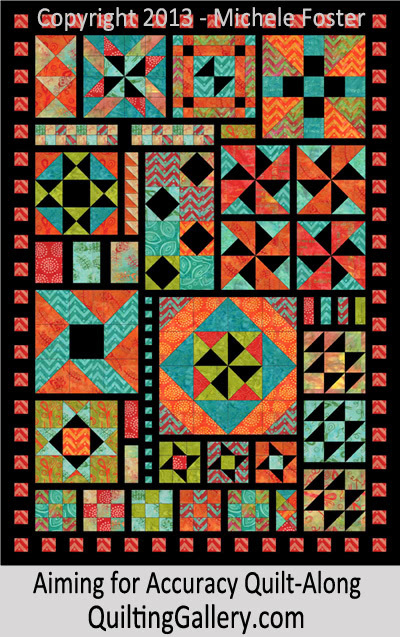 (You'll notice the Quilting Bloggers logo that I added to my right sidebar). A day after being approved I received an email with their latest newsletter encouraging me to join the Aiming For Accuracy Quilt-Along that was starting. It looked like so much fun and would really challenge me. I was a bit behind and the thought of choosing fabrics always makes me panic but I figured why not. So I downloaded the first 3 lessons (2 pre-lessons about recommended products, cutting tips & tools, and the first block lesson) and joined the facebook fan page to keep up with everyone else doing the quilt-along. I feel like we have a million things on our plate right now - our house just went up for sale, we have an upcoming move down to Florida, lots of car maintenance stuff to get done before driving 1000 miles, moving company quotes and relocation services to coordinate, last minute medical stuff to deal with, and a toddler in the mix just to keep it interesting. Where am I going to find the time to participate in a quilt-along?! So last night I posted on the facebook page that I was going to have to be a stalker/bystander and sit it out for a while, hoping to catch up in August or September. But it's really bothering me. I woke up this morning and tossed in bed for an hour, still thinking about this QAL and what fabrics I had that I could get started with. I don't have all of the required fabric (24 fat quarters plus contrasting fabric) but I have various yardage and an idea of a color scheme of purples, blues, and greens with a white background. Despite my best efforts at being logical and NOT participating right now, I think I NEED to do this QAL right now. I'm just going to have to set priorities and figure out a way to sew with everything else going on.